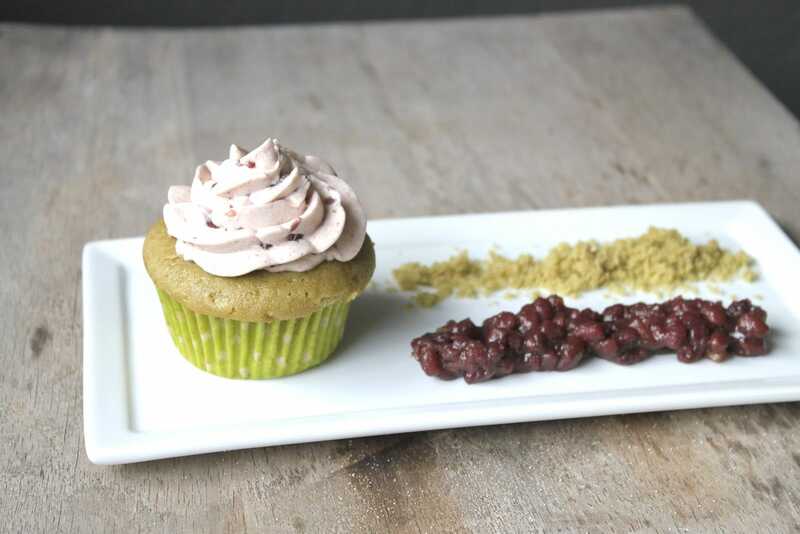 Green tea and red bean go together like peanut butter and jelly. Delicious on their own but even better when paired together. 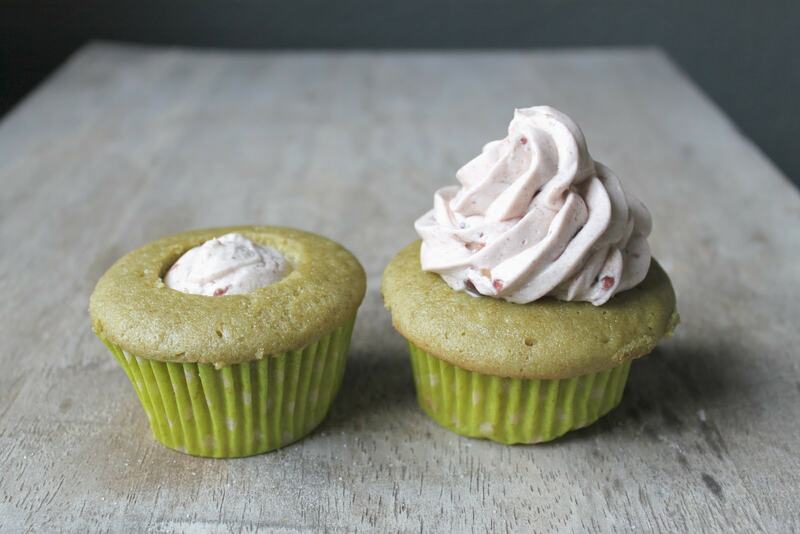 The great depth of flavor in these matcha azuki cupcakes can be attributed to the slight bitterness of green tea and the sweetness of red bean. Beans as part of a dessert? It is used more often than you would think. The azuki or adzuki red bean is quite popular and frequently used in Asian foods, especially in Chinese and Japanese cuisine. Sweetened red bean paste is used as a filling in cakes, pastries, and baked bread buns. Azuki beans are also made into soups and teas. And its made into one of my all times favorites– red bean ice cream. 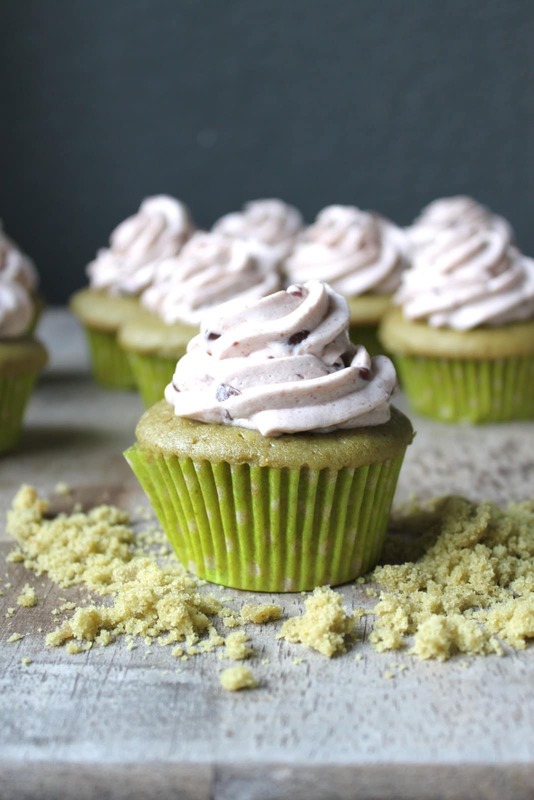 Green tea powder is simple to add into your favorite baked goods– cupcakes, pound cakes, breads and pastries. See my post on Matcha Swirl Tea Cakes; its a great way to introduce newbs to green tea powder. There is a large selection of green tea powders available online. They can be quite pricey depending on the quality and grade of the powder. Taste and color also varies. I have some powders that are bright green and others that are dark forest green. I suggest shopping around and visiting any nearby Asian markets (I find lots of great baking goodies at Mitsuwa and 99 Ranch Market). Try out different brands and find one that suits your liking. 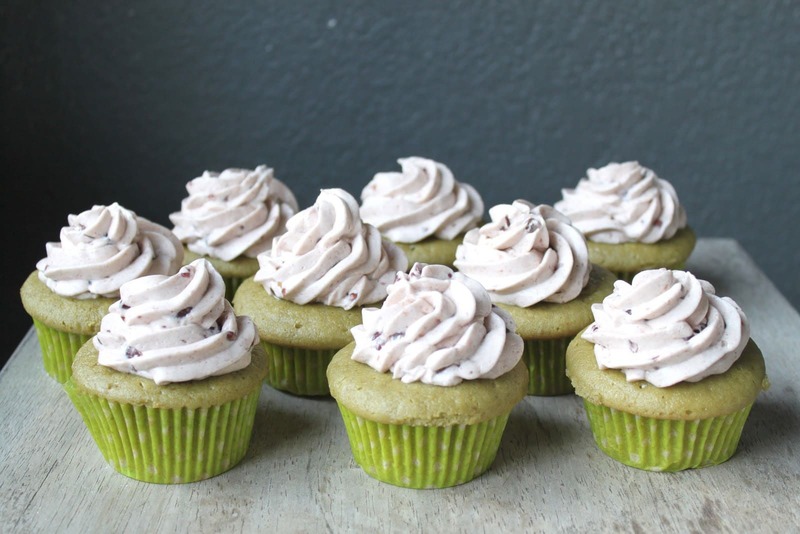 These cupcakes make a great afternoon snack or a nice little pick me up anytime of the day. I love the frosting. I can eat it all by itself because it reminds me of red bean ice cream. Combine flours, sugar, matcha powder, baking powder and salt in the bowl of an electric mixer with a paddle attachment. Mix on low until combined. Add butter cubes and mix until just coated with the dry ingredients. in a large measuring cup, whisk together eggs and milk. Add the wet ingredients to the dry in three additions while the mixer is on medium speed. Scrape down sides of bowl before each addition. Mix until all ingredients are incorporated but make sure not to overmix. Divide batter among lined cupcake pan, filling a little over 2/3 full. Bake 20-25 minutes, until a toothpick inserted in the center comes out clean. In a saucepan, combine sugar and water. Stir until it resembles wet sand. Set to high heat and cook until candy thermometer reads 245 degrees F. While the heat is on, DO NOT stir or disturb the sugar solution. Agitation will cause unwanted crystallization in the sugar solution. If any sugar splashes onto the sides of the saucepan, use a pastry brush soaked in water to dilute any crystal formation. While the sugar is cooking, whip the egg whites in a stand mixer on low speed. Keep it at low until the white are foamy (it should look like the foam on top of beer). Once foamy, begin whipping at medium speed. Starting at a low speed helps to make for a stronger meringue. Once sugar reaches 245 degrees F, pour it into the whipping egg whites in a slow and steady stream. After all the sugar has been poured, increase the speed to high. Continue to whip until the mixing bowl is slightly warmer than room temperature to the touch. Turn down the mixer to medium speed and slowly add the butter a couple tablespoons at a time. Continue to whip at medium speed until all the butter has been added. Whip until buttercream is smooth and creamy. Add about 1/4 cup sweetened red bean paste. You can add more if you'd like a stronger red bean taste. You can use smooth red bean paste or use one that have some whole red beans like I did. If you use whole red beans make sure to use a large enough piping tip to allow the beans to pass. These are stunning-love the colors. I have never used matcha or red beans in a baked good but your post has inspired. I will keep an eye out for the matcha powder. Thanks for sharing the recipe for these lovely cupcakes! @ Tina- Thank you! I hope you find some matcha powder so you can start experimenting! wow these look wonderful I can’t believe how pretty they look too. A must try! These look great! I love the azuki frosting too. Yum! oh. my. god. I love you! My dad LOVES tea and he LOVES red bean! This will be perfect for his Father’s Day dessert treat. I’ll keep my eye out for matcha powder. I live in Hawaii, and there probably will be matcha powder at Chinatown. Thanks Kate! I hope you are able to find the matcha powder! what tip did u use? can we make the frosting without the candy thermometer??? I used a large star tip. I wouldn’t suggest making the frosting without a thermometer. The sugar needs to cooked to a certain point for the frosting to whip together. Trying to make these. Wanted to double check on the butter for the topping – 12 oz – that’s 3 sticks. Plus the 1/2 cup for cupcake, which is 4 oz. So in total a full pound of butter in 12 cupcakes???!!! Please confirm. Thanks! Wah! Nice recipe! Looks so scrumptious! What type of red bean paste? May I know where did you get them? I only see one type in phoon Huat.